Fire and Ice: The Alaska State Nordic Ski Championships 2015 started with warm, clear weather and ended with soggy rain on the man-made snow at Kincaid Park February 19-21, 2015. Skimeisters are Max Donaldson and Lydia Blanchet with West taking girls 4A and Service the boys. Homer took small school girls while Grace repeated for boys. video credit: George Tsau-Wu. “Start a Fire” by Unbroken. Trail conditions at Kincaid Park were challenging as the ASAA/First National Bank Alaska state meet weekend approached, February 20-22. 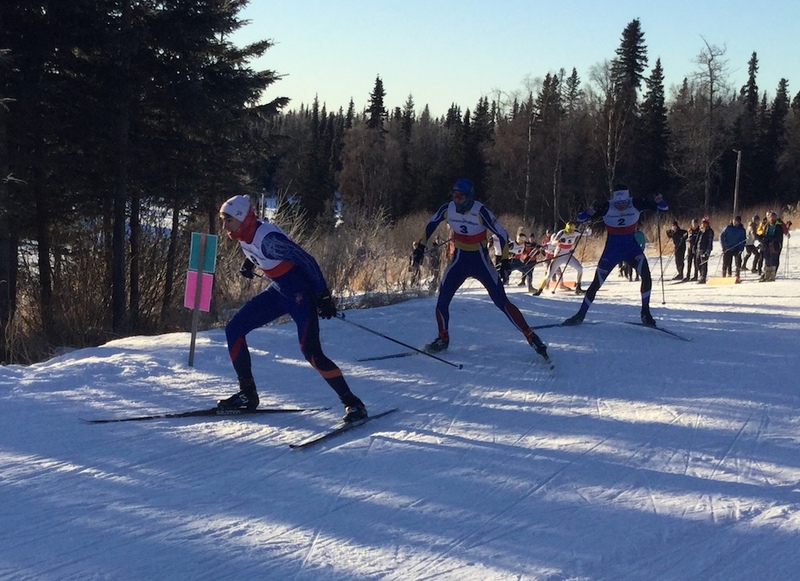 Co-hosted by Dimond High School and the Nordic Skiing Association of Anchorage (NSAA), changes to the original race trail selections were made. However, an opportune snowfall on Tuesday night prior to the first race on Thursday brightened the venue and lifted everyone’s spirits. Day one featured freestyle interval start races with the girls going 5 km and the boys 7.5 k. The girls race had Sarissa Lammers of Chugiak High School skating to a 22 second victory over Sadie Fox of Soldotna High School, winning with a time of 14:43.0. Anna Darnell of South Anchorage rounded out the top three, another 15 seconds behind Fox. Max Donaldson of West Valley High School in Fairbanks picked up where he left off last year and pounded out a 15 second win over Seiji Takagi of South Anchorage. Thomas O’Harra rounded out the podium another 28 seconds back of Takagi. The next day’s mass start classic races would determine the 2014 high school skimeisters. 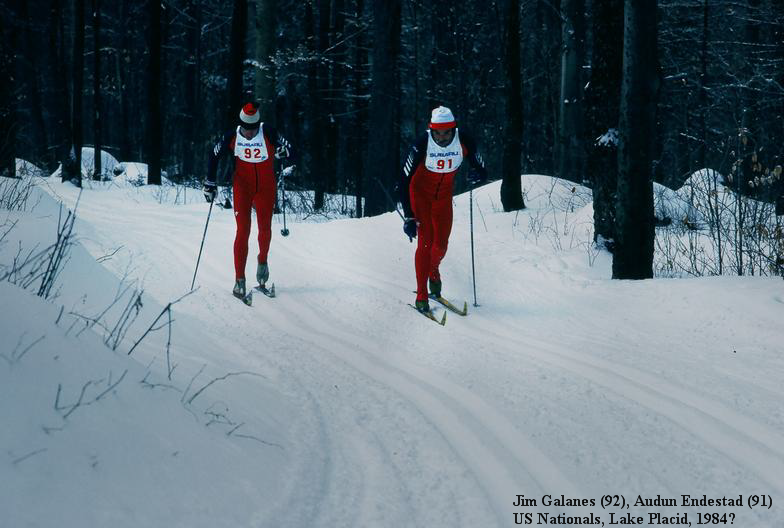 The way Lammers and Donaldson were skiing, they were going to be hard to overtake. The boys were going 10 km and Donaldson did not disappoint. While Jake Bassett of Service High School took the overall classic win with a dominant performance, Donaldson, finishing second, increased his skimeister lead over both Takagi and O’Harra. Takagi finished just off the podium in fourth while O’Harra repeated his third place performance of the day prior. In the end, Donaldson defended his skimeister crown from 2013. Takagi was vice-skimeister and O’Harra remained in third. Lammers carried her momentum from day one into the 7.5 km classic event on day two. She skied the entire race in the lead pack, squeaking by with a photo finish victory over Taryn Hunt-Smith of Service High School. Fox slipped a spot to third, a solid showing nonetheless. Lammers was crowned 2014 skimeister with Fox second and Morgan Flynn of East High School skied consistently to a 3rd place overall result. Another sunny day greeted racers for the Saturday mixed technique relays. Girls would go 4 X 3 km and boys would go 4 X 5 km in classic, classic, freestyle, freestyle fashion. The girls race was hotly contested. In the end, Service grabbed the win over South. The boys race looked like a runaway affair with Service taking a commanding lead on the first two classic legs. Both West Valley and South reeled in the Service squad on the first freestyle leg, leg three. West Valley would continue to put the hammer down and took the 2014 win. South was runner-up and Service faded to third. In the race for team champion, 47 seconds separated South Anchorage and West Valley boys: 4:11:42 to 4:12:29. Nearly three and a half minutes separated the South Anchorage and Service girls: 3:25:41 to 3:29:08. This was the first team sweep for South Anchorage since 2010. State Relay Boys 2014 from Robert W Arnold on Vimeo. The ASAA/First National Bank Alaska 2013 Nordic Skiing State Championships were contested February 21-23 at Kincaid Park in Anchorage, Alaska. Hosted by the Alaska School Activities Association (ASAA), A.J. 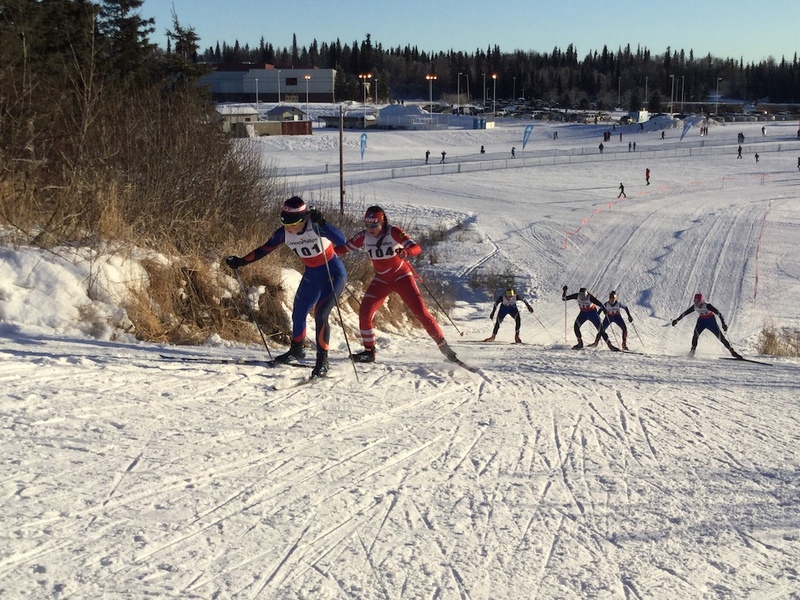 Dimond High School, and the Nordic Skiing Association of Anchorage (NSAA), the three-day event provided plenty of action at the well-known and competitive trails of Kincaid Park. The total time of the first two day’s of racing would crown the state skimeister for both boys and girls. Day one featured interval start races: 7.5 k for boys and 5 k for girls. At the conclusion of the boy’s races, the boys winner was Eric Backstrum of South Anchorage followed by Jake Bassett of Robert Service and Thomas O’Harra of East Anchorage. Just off the podium was Max Donaldson of West Valley High School in Fairbanks. The top four were separated by 4/10th’s of a second! The girl’s 5 k champion was Lydia Blanchet of West Anchorage. She was followed by Marion Woods of South Anchorage. Rounding off the podium was Morgan Flynn of East Anchorage. While not quite the drama of the boys race, the girls result would dictate how fast the pace would be pushed during the mass start event on Friday. Fresh snow greeted the Chief of Competition, Matt Pauli, for day two. In addition, a vehicle (jeep to be exact), managed to plow thru a snow berm and access approximately .5 k of race trail. Still four hours away from post time at 1100, the race trail was quickly and expertly regroomed creating even a better racing surface. As a side note, the jeep became stuck well off the race course where the culprits were found, the police were summoned, the officers got to ride a Pisten Bully to the culprits, the culprits were apprehended and lead away in hand cuffs; trail damage and equipment use to be invoiced by NSAA later. The PB 100 towed the jeep out while the PB 600 went about fixing the damaged trail. So much for that drama. Racing action ensued with the girls mass start 7.5 k. Chevron start positions were determined by Thursday result. After Thursday’s racing, Blanchet, wearing bib #1, was 20 seconds clear of Woods. Woods definitely knew this as she lead from the gun and pushed the pace. While the result order was reversed from the previous day, it was not enough to take over the overall skimeister position as Blanchet finished only four seconds behind in the mass start. To round out the podium, Teagan Yutrzenka of South Anchorage put in a strong performance, finishing 20 seconds after Blanchet. What was assumed to be a strategic race for the boys 10 k (2X5 k loops) became a lesson taught by Donaldson of West Valley. Tanner Ramey, hoping to make up a 14 second deficit after the first day of competition, opened up with a strong first lap, trailed closely by Donaldson. Racers began each lap with Elliot’s Climb at approximately the 700 m mark of each lap. It was here that Donaldson put the hammer down and created the exclamation point that would make him the first state skimeister from West Valley since 1982. O’Harra of East would move up a spot to second, just holding off Jacob Volz of West. Racing concluded with the mixed technique relays. The South girls handled the 3 k loops easily, besting Service by 2.5 minutes. Wearing trucker caps furnished by their coach, Christina Turman, the West Valley boys ski’d the 5 k loops easily and etched their school’s name on the state championship trophy for the first time since 1993. 2013 HS Nordic Skiing State Championships from Smith Services Alaska on Vimeo. 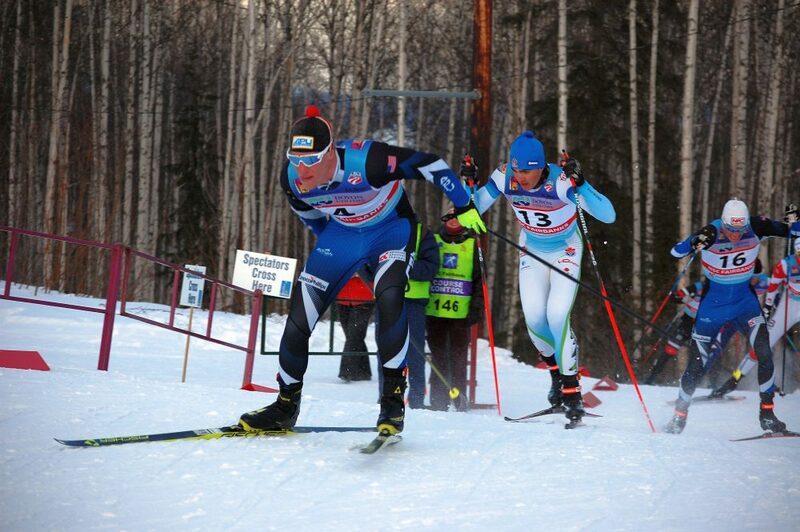 February 23-25, the Alaska High School Championships were held at Kincaid Park in Anchorage. 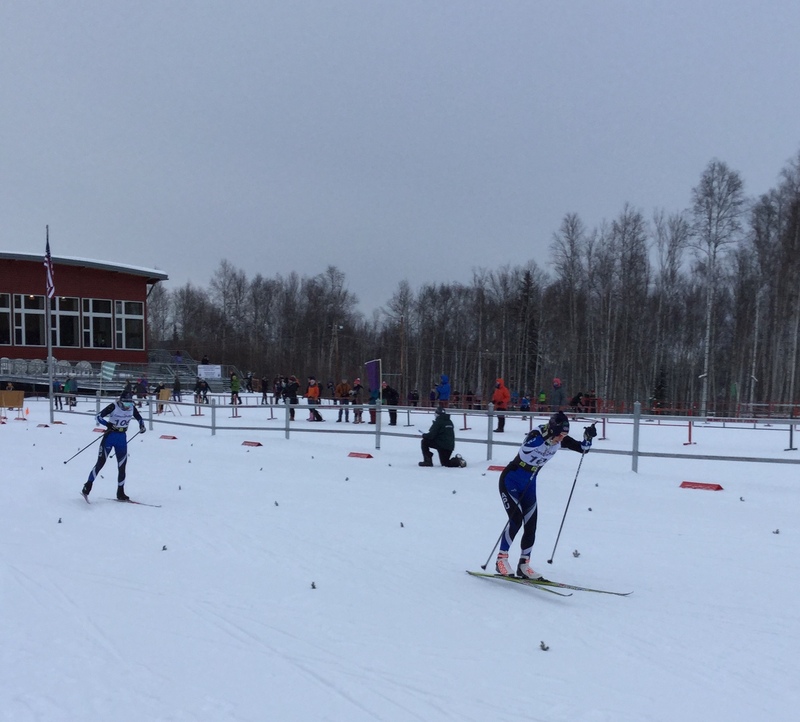 Hannah Boyer (Fairbanks) three-peated as Skimeister girl just ahead of Marion Woods (Anchorage) while Isaac Lammers (Chugiak) was boys skimeister. For Teams, Service won for boys and West Valley girls large schools while Grace won for small schools. Hannah Boyer (NSCF/FXC – OJ) repeated as the winner in the second day of Besh Cup racing at Birch Hill, while Jack Novak (APU – OJ) and Saturday’s winner, Tyson Flaharty (Goldstream Sports – SR) traded places. Boyer’s victory margin was only seven seconds, considerably less than her 45-second win on Saturday. Novak crossed the line just a few ski lengths ahead of Flaharty. The women’s 10Km was much more of a pack race than normal for the women’s field. At the finish of the first 5Km lap, fourteen women were still in a group at the front of the race. On the second lap Boyer pushed the hills and was able to establish a gap over her competition. Runner-up was Sarah Freistone (AWS-J1), just two seconds ahead of the second OJ, Kinsey Loan of APU. UAF red-shirt skier Kryston McPhetres (ANR-OJ) was fourth overall, 5 seconds ahead of UAF redshirt senior Theresia Schnurr and 11 seconds ahead of Bree Mucha (ANR-OJ). Masters skier Melissa Lewis was seventh and first master, and Megan Edic (NSCF/FXC-OJ) was eighth overall. 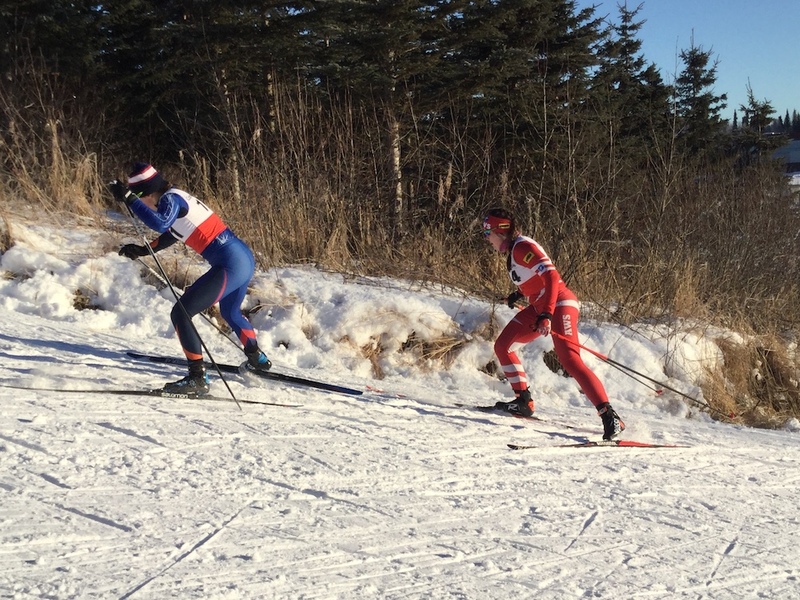 Locals Hannah Boyer (NSCF/FXC) and Tyson Flaharty (Goldstream Sports) used their familiarity with the newly upgraded competition trails at Birch Hill to post comfortable victories in the women’s 5Km and men’s 10Km, respectively on Saturday. Lydia Blanchet (J1-APU), Kinsey Loan (OJ-APU), and Eliza Rorabaugh (OJ-NSCF/FXC) rounded out the top five in the women’s 5Km. Behind Novak were Austin Hess (J1-AWS), Kyle Hanson (J1-NSCF/FXC) and John Glen (J1-AWS). The race start had been postponed from 11AM until 2PM based upon the weather forecast that predicted low temperatures in the morning before warming up as clouds moved in. The followed the forecast to the hour, with the temperature at 2PM sitting at a USSA and FIS “legal” temperature of -2F/-19C, warming up to +7F/-14C for most of the second half of the race. The races were held in interval start format in classic technique on the new “Black Funk 5Km” loop. This loop was created over the summer by utilizing several existing trail segments, creating some new trail, and modifying some existing trail. Reviews by coaches and athletes were universally positive. There is still a little work to be completed in summer 2013 to get the trails into their final configuration and appearance. However, today’s course was a very good representation of the final product. The trail meets all standards required for certification by the International Ski Federation. Hannah Boyer (NSCF/FXC), women's winner. The trails have been upgraded in anticipation of the 2013 US Ski and Snowboard Association Junior National Championships and the 2014 Arctic Winter Games. This was the first real test of the trails in a high-level competition. Several of the skiers who raced today will be competing on these trails in 13 months as members of the Alaska Team at the 2013 JN’s. Tomorrow’s race will start as scheduled at 11:00AM, given the current forecast. Approximately one hour following the race, the Alaska Teams to the 2012 Arctic Winter Games in Whitehorse and the 2012 Junior Nationals in Soldier Hollow, Utah will be named. In addition to the naming of the teams, the Besh Cup awards, given for season-long performance in the Besh Cup series, will be presented. The team selection and awards ceremony will be held in the Assembly Room of the Birch Hill Cross Country Ski Center. Current rankings for AWG and JN team selection can be found at crosscountryalaska.org. 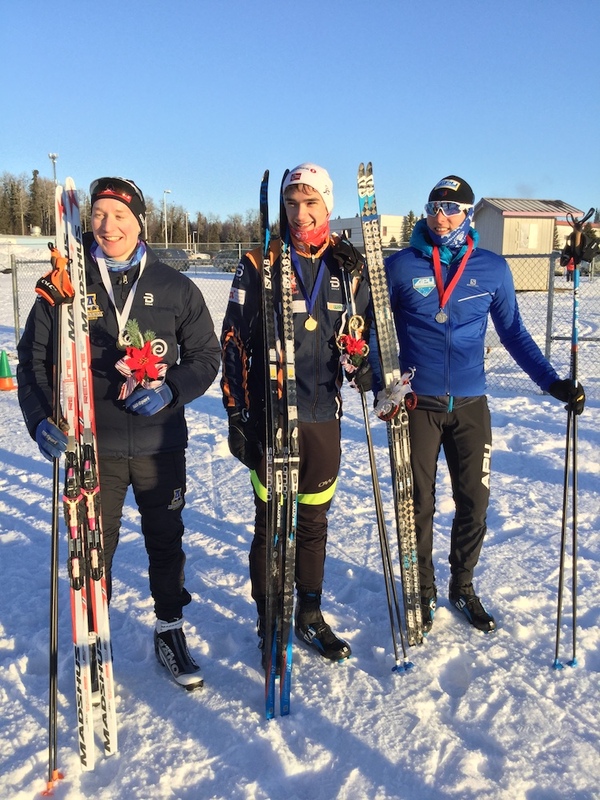 The Arctic Winter Games, a bi-annual winter sports competition for young athletes from Arctic regions, featured four days of cross-country ski racing in Grand Prairie, Alberta. The Games officially conclude on the 14th, but all cross-country competitions have been completed. Complete ski results from the Games can be found at www.zone4.ca. Many athletes from Alaska competed against Canadaian provinces and Greenland, among others. With two races down at the 2010 Junior National Championship in Presque Isle, ME, New England has come out strong. With a total of 946 points the New England team is clearly the team to beat. The Alaskan team showed strength in the FOJ class during the sprints and in both boys and girls J1 classes during the classic distance race. They lurk in second with a total of 584 points, while the Intermountain Division is holding on to third with 385 points. Tyson Flaharty (FAST) made it two for two with a victory at the wire, and the Alaska Nanooks Aurelia Korthauer led from wire to wire to win in the final race of the Besh Cup series at Birch Hill. Following the race, Cross Country Alaska announced the teams selected for the 2010 Junior Olympics in Presque Isle, Maine and the 2010 Arctic Winter Games in Grande Prairie, Alberta. The weather on Sunday was a bit cooler than on Saturday — in the single digits above zero, rather than in the high teens to mid-20’s. However, the temperatures were perfect for rock-hard tracks and bomb-proof kick, a critical need if skiers wanted to get a good result on the very challenging courses which included some steep hills which tested the best skiers ability to run straight up and avoid herringboning. The combination of the great conditions, challenging and well-prepared courses, and excellent race organization drew rave reviews from the competitors and the visiting coaches and parents. Hats off to the Nordic Ski Club of Fairbanks race crew for another great production. It wouldn’t happen without the great, knowledgeable, skilled, experienced and energetic volunteers. The start of the women's 10km. In the women’s 10Km, Aurelia Korthauer celebrated her birthday by taking the lead from the gun. For the first couple of kilometers her teammate Teresia “Te-Te” Schnurr and ANR’s Kinsey Loan kept pace, but by the time the skiers returned to the stadium at the end of the first lap, just before the 4Km mark, Korthauer had a huge lead that would only grow for the rest of the race. Both Schnurr and Loan would pay for their attempt to stay with Korthauer, as they faded to eighth and twelfth, respectively. 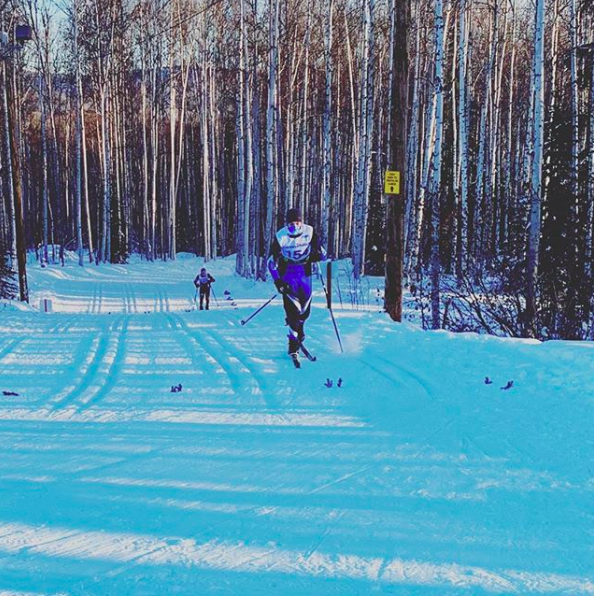 Meanwhile, many of the out-of-town Junior 1 and Older Junior high schoolers went out overly ambitiously, and were reeled in and then dropped by the UAF skiers who train regularly on the Birch Hill trails, as well as by local skier Hannah Boyer (FXC/WVHS). Pacing was crucial, and skiers who waited until finishing the climb out of the Black Funk loop to put down the hammer did well. Anna Coulter, who was just back of the three leaders early was the runner-up, Boyer moved up to third, Alaska Nanook Elisabeth Angeles ended sixth, and UAF redshirt skiers Heather Edic and Rebecca Konieczny placed ninth and tenth, just behind Schnurr, giving UAF six of the first 10 positions. Korthauer’s winning margin was 1:48. The start of the men's 10km. The men’s 10Km followed a very different pattern, with a lead pack forming early, and the outcome of the battler for first in doubt until the final meters. 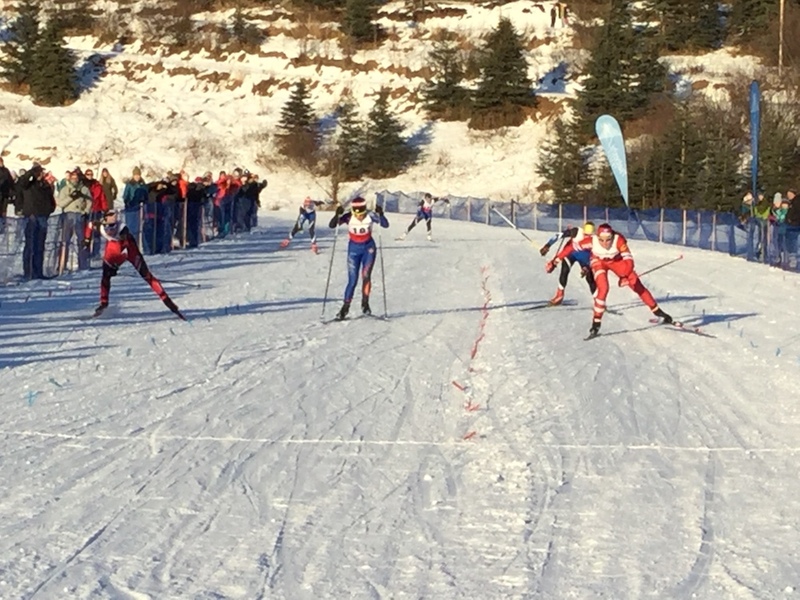 Initially FAST’s Tyson Flaharty, David Norris and Logan Hanneman joined up with APU coach Dylan Watts to form the lead pack, with ALaska Nanook Tyler Kornfield close behind. However, by the time they had finished climbing out of the Black Funk and ascending the Ramp, it was a duel between Flaharty and Watts, who traded the lead for much of the rest of the race. 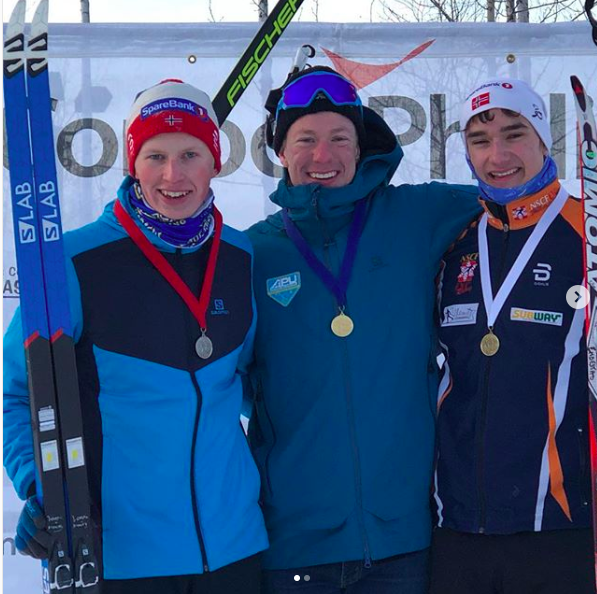 Norris, just back from Junior World Championships in Hinterzarten, Germany, was relatively comfortable in third, but Nick Treinen (AWS), who hitched a ride with Norris on Saturday, reeled in Logan Hanneman to make a very tight race for fifth place. Meanwhile, Kornfield, who had great success on these trails at the 2009 ASAA State High School Championships, looked like he was showing the effects of racing and traveling the the Junior World Championships, was slowly fading backward, and finished eighth. Finish of the men's race. Flaharty and Watts came down the finish lane side-by-side and Flaharty had the extra gas at the end, taking a close, but clear victory. Norris was third, and Hanneman, after getting caught by Treinen, was able to pull away at the end and snag fourth. The other notable local result was by Pat Nugent (FXC/LHS)who needed a good result to make the JO team. Nugent appeared to be struggling at times, but worked his way up to a position that would assure him a spot on the team, and put on a hard sprint at the finish to hold his finish rank. In the J2 Boys’ 5Km race, Lathrop HS’ Kyle Hanson cemented his position on the JO team with a third-place finish, one of his best results of the season. John Glen and Austin Hess (both AWS) placed 1-2. Among local skiers, Erich Hoefler (FAST) and Riley Troyer (WVHS) placed 5-6, and Kuba Grzeda was 10th. Anchorage area skiers dominated the J2 Girls’ 5Km, with Marion Woods (AWS), Celia Haering and Mackenzie Flynn (both APU) taking the podium positions. Mikayla Hamlin (FXC) was the top Fairbanks skier in 10th. 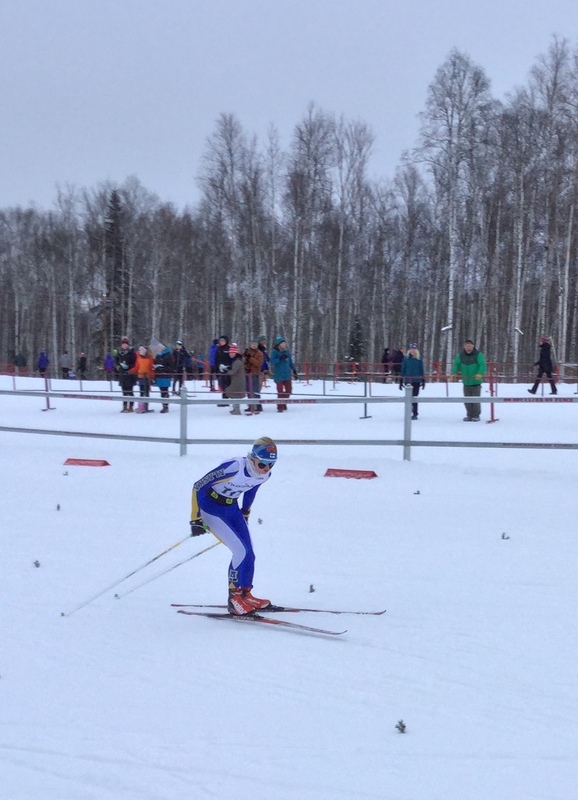 The Alaska Nanooks’ Julia Pierson and Team FAST’s Tyson Flaharty were the winners in Saturday’s Besh Cup racing on the Jim Whisenhant Ski Trails at Birch Hill Recreation Area. Saturday’s event was an interval start (15-second intervals) event in free technique. Sunday’s race will be a mass start event in classic technique, beginning at 11:00AM. 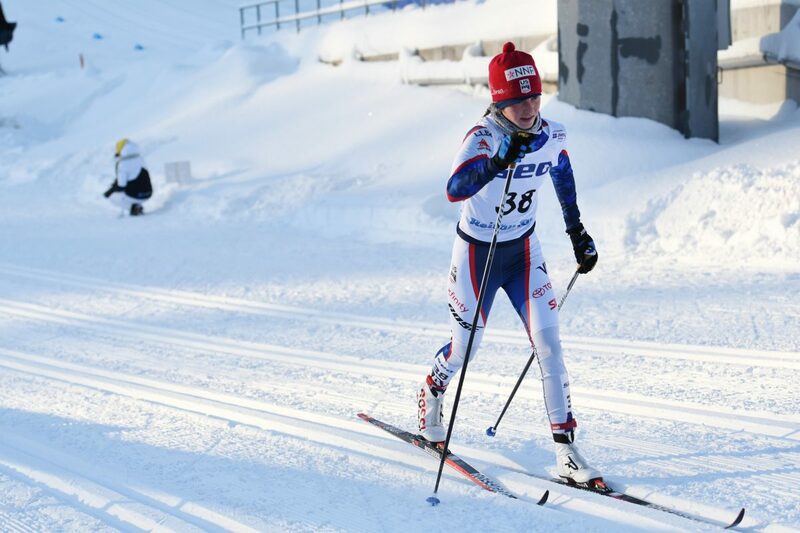 Sunday’s race is also the final event in the 6-race qualifying series that determines who will qualify for the Alaska teams to the 2010 Junior Olympics in Presque Isle, ME, and the 2010 Arctic Winter Games in Grande Prairie, Alberta. When the decision was made Wednesday night to hold the races as scheduled this weekend, the temperatures were very cold, but the forecast was positive. 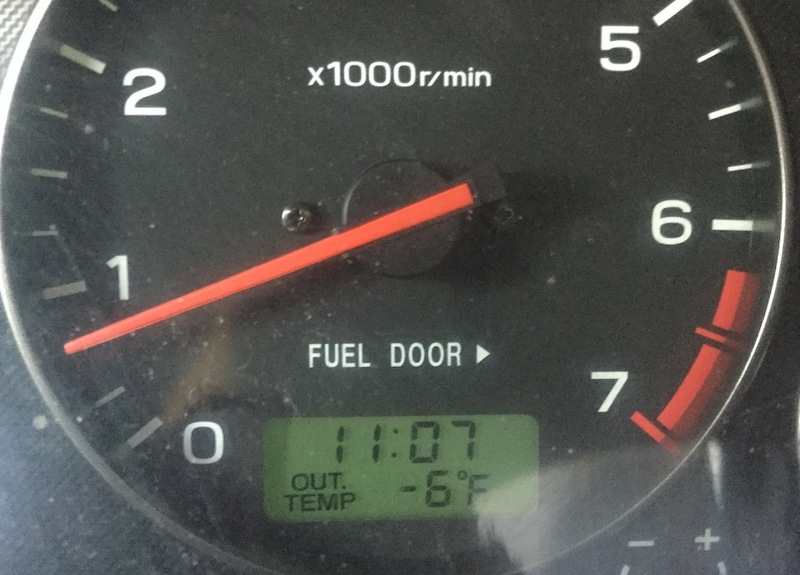 The weather changed as predicted, and even earlier than scheduled, so that temperatures at the start were in the mid-teens, and the mercury even touched +20F before the racing was concluded for the day. The course used was the tradiitonal “Three Hills” course, using the Blue Loop, the East Ramp/Tower Direct climb, and the White Bear/White Bear Access ascent back to the stadium. This is the same course that will be used for the ASAA state high school championship girls 5Km interval start event at the end of this month. Pierson beat her red-shirt teammate, Raphaela Sieber by only 0.3 seconds over the 5Km distance to take top honors. Next behind Sieber was Celia Haering, a J2 from Alaska Pacific University NSC (APU) at 15:02.4. Fairbanks Cross Country (FXC)/West Valley HS teammates Marisa Rorabaugh (1st OJ) and Hannah Boyer (1st J1) were fourth and fifth in 15:10.1 and 15:12.9, respectively. 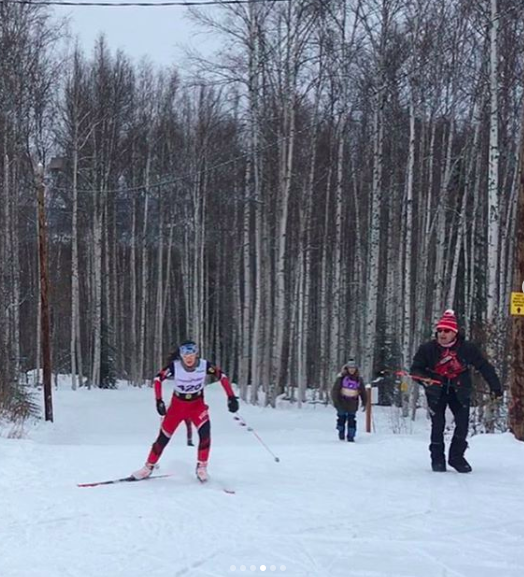 Behind Haering in the J2 class were Stephanie Kirk of Alaska Nordic Racing (ANR), Marion Woods of Alaska Winter Stars (AWS), Maranda Merkes of Soldotna HS, And Eliza Rorabaugh (FXC/WVHS). Jessie Yeaton (OJ), Kryston McPhetres (J1/ANR) and Mackenzie Kanady (J1/AWS) rounded out the top five for J1/OJ girls. The USSA points penalty for the women’s 5Km was 116.65. The J1-OJ-SR-MA men did two laps of the women’s 5Km course. Tyson Flaharty of the Fairbanks Alaska Ski Team (FAST) was 21.9 seconds faster than APU coach Dylan Watts (25:55.8 to 26:17.7). FAST’s David Norris was third and was first in the J1/OJ rankings, Alaska Nanook John Parry of Whitehorse was fourth, and Nick Treinen (AWS) was 2nd OJ and 2nd in the J1/OJ rankings. Three J1 skiers, Logan Hanneman (FAST), Forest Mahlen and Jack Novak (both APU), rounded out the top 5 in the J1/OJ group. The USSA points penalty for the men’s 5Km was 60.78. The minimum penalty for regional NRL events for men is 55 points, so this was a very good opportunity for skiers to earn some excellent points with a fast race. In the J2 boys 5Km, AWS took 1-2 with Austin Hess (14:08.0) and John Glen (14:20.2). Lathrop HS’ Kyle Hanson had an excellent race, placing third in 14:23.7. Douglas Watts (West Anchorage HS) and Jake Prince (AWS) were fourth and 5th. Local skiers Kuba Grzeda (FAST/WVHS) and Riley Troyer (WVHS) helped their qualifying rankings by placing 6-7, and Eric Hoefler (FAST) was 9th. Eight J2 boys (and eight girls) will go to the Junior Olympics and four J2 boys (and 4 J2 girls) will go to the Arctic Winter Games. APU’s Jacob Bassett and Tanner Ramey and FXC’s Max Donaldson filled the J3 podium, and Tracen Knopp (ANR), FXC’s Benjamin Koenig and Louis Bassett (APU) were on the steps for J4’s. Lydia Blanchet (APU), Sarissa Lammers (ANR) and Taryn Hunt-Smith (APU) placed 1-2-3 in the J3 Girls class and Amber Lenze, Jenna DiFolco and Maya Yoshikawa (all Fairbanks Junior Nordic Competition Group/JNC) were on the J4 podium. Among the littlest skiers, the J5 winners were Gus Schumacher and Amber Hajdukovich, and the J6 winners were Rudy Schumacher and Halene Johnson. The Anchorage Daily News has been providing excellent coverage of the Junior Olympics, including photo galleries. 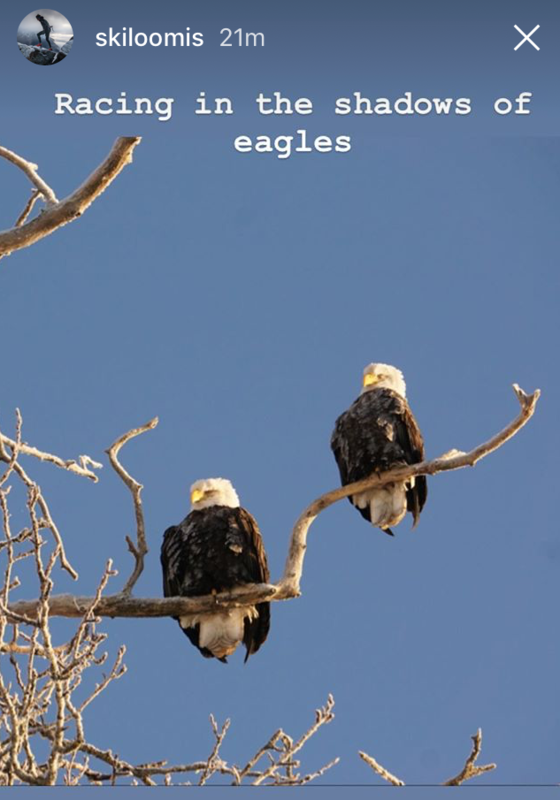 Here are links to the stories and photos…. We are excited to welcome all the athletes to Kincaid Park, racing on our home courses. We wish the snow conditions would have been better, but, thankfully we’ve been spared by mother nature and with lots of hard work by the organizers we had an exciting and competitive sprint race. We were impressed by the level of fitness of the other divisions, especially New England who ended the day 2 points ahead on Alaska Cup standings. Nice job! We were stoked to to have two National Champions (Amy Glen and Becca Rorabaugh and many skiers into the final rounds in all divisions.